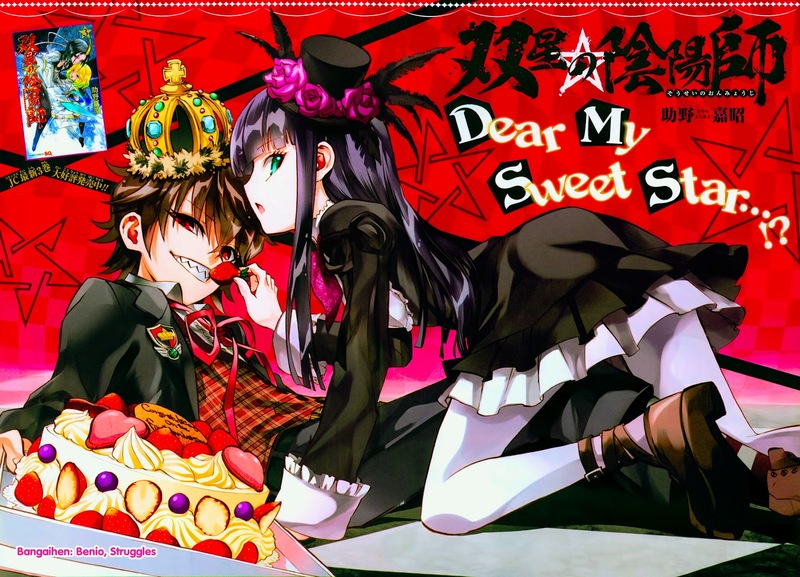 Sousei no onmyouji ( Twin Star Exorcists ) is a series adaptation of the Twin Stars manga. Studio Pierrot are in charge of it a studio who did : 220 episodes of the original Naruto,366 episodes of Bleach, Tokyo Ghoul and 122 episodes of Yu Yu Hakusho. So they have an very long and impressive track-record with the shounen genre. And I’ve enjoyed almost every single shounen they’ve put out. But Twin Stars so far feels like the most life-less and as if at this point they’re plugging the correct values into the formula. If you’ve watched at least a few typical anime you’ll probably think that Twin Stars feels very familiar , because it’s probably the light version of what you just watched. The comedy is the very minimum required for something to be a joke and I don’t remember laughing once. The story is very basic. In this universe in a parallel dimension exist demons or impurities and every now and again they invade the human world for the very purpose of stopping them exists a warrior class known as the exorcists who wield magic and blades to fight back. Just from reading the synopsis on MAL two words jumped into my head “ Noragami “ and “ Yu Yu Hakusho “. In fact this story is almost word for word Yu Yu with some concepts re-worked and simplified except for when Yu Yu did it not only was it still a fairly fresh idea there was also a lot of heart and passion put into it with a lot creative people working on it. I doubt there was a single person on the Twin Star team that actually cared about making this show. Since from the very first episode I was able to successfully predict every single thing that was going next ,without fail. I can’t recall a single track from the OST that made me feel anything or even think , “ yeah , that’s pretty good “ it just went on in the background. In Naruto I remember instantly jumping up and getting excited whenever the main battle theme kicked in, it was complex with several instruments , had a unique style to the rest of the tracks and fitted the general mood needed to complete the scene. Now guess how many of those boxes the Twin Stars soundtrack checks. Sound design is practically non-existent besides for some stock combat noises and shimmers for the magic attacks. The VA for the main character really grated on me too, he voice was too rough and too old for what was meant to be the portrayal of a young teen. At some points his performance dropped really low as though he’d gotten shy in the recording booth , or maybe he just didn’t care to muster up enough energy for this role seeing as he has a pretty good CV portraying Jaco in Dragon Ball Super and the Inaho in Aldonoah Zero. General art-work in the human world is ok. Nothing too spectacular , but the one thing the show really had going for it was the demon world. It’s very stylized and colourful with vibrant yet grimy reds layered across black and grey in a crumbling civilizations. The demons were all wonderfully designed and I remember being genuinely impressed when I saw a small demon start eating his comrades and with each bite upgrade and bulk up. It was a really cool little piece of animation. I wonder if those things were handled by some very passionate interns? I also wonder whether or not the general animation was outsourced to some other country , since it certainly feels budgeted. There’s a lack of detail in characters and backgrounds , movement is very one dimensional and often feels like watching cardboard cut-outs. The fight scenes are really well choreographed and have an impressive array of special moves and flashy attacks. And benefit from the bonus of being set in the awesome demon realm. Sadly the flowing sense of movement and impact is ruined no matter how well planned out , when it looks like a flash sprite being dragged across the screen most of the time. Shots and composition are the bare minimum with no deviation from the standard set used everyone uses. The exorcists weapons of choice, talismans in the forms of paper that need to be activated are rather well animated and have nice transitions. The talisman that opens up the portal between the human and demon realm might be one of the better moments in the show. Where in the first episode the lights on a train flicker out , the talisman is cost and in flash we’re in the hellish landscape. It seems like the demons are the only ones who didn’t suffer from the animation issues as their designs were always creative and dark in a fascinating way. There was also a good mix of art-style from defined and smooth to very rough and thick black line. Character designs are fairly widely varied and take inspiration from historic Japanese temple clothing. Sadly the designs usually get lost in the background drawn in the crudest manner. Their personalities are shounen textbook and as with the story I knew the next thing out of their mouth before they said it. The MC is as standard as it gets with the most predictable development possible. He shares his “tragic backstory “ with at least three other MCs this season. He has absolutely no passion for what he’s doing and no real motive to do besides for “because it’s right “. There’s nothing about him that anyone can relate to since he’s just a cultivation of tropes.